Winston Churchill, 1941. Gelatin silver print. Available at 20 x 16, or 24 x 20 inches. Ernest Hemingway, 1957. Gelatin silver print. Available at 20 x 16, or 24 x 20 inches. Georgia O'Keeffe, 1956. Gelatin silver print. Available at 20 x 16, or 24 x 20 inches. Andy Warhol, 1979. Gelatin silver print. Available at 20 x 16, or 24 x 20 inches. Pablo Picasso, 1954. Gelatin silver print. Available at 20 x 16, or 24 x 20 inches. Alberto Giacometti, 1965. Gelatin silver print. Available at 20 x 16, or 24 x 20 inches. Pablo Casals, 1954. Gelatin silver print. Available at 20 x 16, or 24 x 20 inches. Albert Einstein, 1948. Gelatin silver print. Available at 20 x 16, or 24 x 20 inches. Mies van der Rohe, 1962. Gelatin silver print. Available at 16 x 20, or 20 x 24 inches. Audrey Hepburn, 1956, Gelatin silver print. Available at 20 x 16, or 24 x 20 inches. Albert Schweitzer, 1954. Gelatin silver print. Available at 20 x 16, or 24 x 20 inches. Frank Lloyd Wright, 1945. Gelatin silver print. Available at 20 x 16, or 24 x 20 inches. George Bernard Shaw, 1943. Gelatin silver print. Available at 20 x 16, or 24 x 20 inches. Grace Kelly, 1956. Gelatin silver print. Available at 20 x 16, or 24 x 20 inches. Humphrey Bogart, 1946. Gelatin silver print. Available at 20 x 16, or 24 x 20 inches. Jasper Johns, 1990. Gelatin silver print. Available at 20 x 16, or 24 x 20 inches. Jacqueline Kennedy, 1957. Gelatin silver print. Available at 20 x 16, or 24 x 20 inches. Joan Miro, 1965. Gelatin silver print. Available at 20 x 16, or 24 x 20 inches. Muhammad Ali, 1970. Gelatin silver print. Available at 20 x 16, or 24 x 20 inches. Martha Graham, 1948. Gelatin silver print. Available at 20 x 16, or 24 x 20 inches. W.H. Auden, 1972. Gelatin silver print. Available at 20 x 16, or 24 x 20 inches. Armenian-Canadian photographer Yousuf Karsh (1908 – 2002) is known for his iconic portraits of some of the leading figures of the 20th century, from Albert Einstein and Winston Churchill to Jackie Kennedy and Andy Warhol. During a career that spanned six decades, Karsh developed a distinctive portrait style that included the use of artificial lighting in order to achieve dramatic effects. 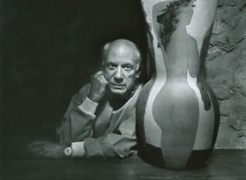 He was meticulous in his approach; prior to a session, Karsh would conduct extensive research relating to the sitter, studying existing photographs and often meeting with them in advance. This, combined with his particular use of lighting and careful posing, enabled Karsh to simultaneously convey the private personality and the public persona of his sitters. His 1941 portrait of Winston Churchill, published on the cover of Life magazine in 1942, launched Karsh’s international career. He went on to travel the world photographing many of the world’s most prominent personalities. Yousuf Karsh was born in 1908 in Armenia and, after fleeing with his family to Syria in 1922 to escape persecution, he immigrated to Canada in 1925. He was introduced to photography by his uncle, who facilitated his apprenticeship with the renowned Boston portrait photographer John H. Garo in 1928. This led to Karsh setting up his own portrait studio in Ottawa in 1932. He moved to Boston, Massachusetts, in 1992, where he died in 2002. Karsh received numerous awards throughout his life, and was a two-time recipient of the Order of Canada for lifetime achievement. Major retrospectives have been held at the National Gallery of Canada, Ottawa; the Deutsches Historisches Museum, Berlin; the Museum of Fine Arts, Boston; and the National Portrait Gallery, London. His work is held in numerous major public collections including the Art Institute of Chicago; the National Portrait Gallery, London; the Metropolitan Museum of Art, New York; the Museum of Fine Arts, Boston; the Museum of Modern Art, New York and the National Gallery of Canada.